A priesthood blessing may be given only by those who have been ordained to the Melchizedek Priesthood. In the Church, most boys at the age of twelve have the Aaronic Priesthood conferred upon them and are ordained to the office of deacon. At age fourteen, they are usually ordained teachers, and at age sixteen, priests. If the priesthood bearer continues to show faithfulness and worthiness, then at age eighteen, or anytime thereafter, he may receive the Melchizedek Priesthood with ordination to the priesthood office of elder. 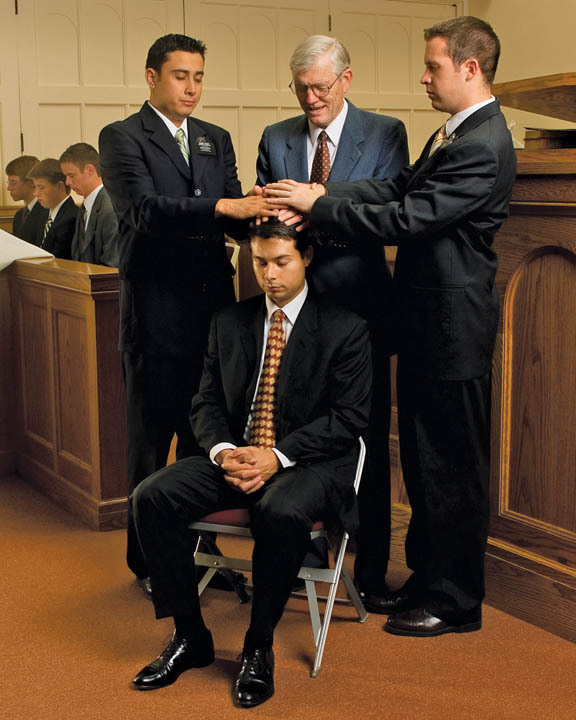 An elder in the Melchizedek Priesthood has authority to perform most priesthood functions in the Church, including giving priesthood blessings. Each priesthood ordination, from deacon to apostle, is a type of priesthood blessing and is characterized, as are all priesthood blessings, by (1) the laying-on of hands by those in authority, (2) an invocation of the authority of the priesthood and the name of Jesus Christ, and (3) such words of blessing as follow the impressions of the Spirit. This third element, that of spiritual impressions, is vital for any priesthood blessing. A fundamental doctrine of the Church is a belief that a worthy priesthood bearer, when giving a priesthood blessing, will receive promptings from the Holy Spirit regarding what is to be spoken-not necessarily the exact words, but ideas or thoughts that he will then express as clearly as he can in his own words. This is the essence of a priesthood blessing, and distinguishes it from a prayer. A prayer seeks to communicate with God, either vocally or silently, and is rooted in the faith that God will hear the words or the thoughts and feelings and then, in his infinite wisdom and power, will respond. A priesthood blessing is based on trust that the priesthood holder, while speaking the blessing, will receive spiritual promptings regarding what is to be spoken and thus his words represent the will of God. As described in the quote, Elders in the Mormon church are ordained to the Melchizedek priesthood. The Elders within a congregation are assigned to be “Home Teachers”, or overseers for 3-5 families within the congregation. Hometeachers are assigned in pairs of two and visit the homes of their assigned families on a monthly basis. Part of their duty is to ensure the families’ physical, temporal, and spiritual needs are being met. This requires the Elders to stay in tune with the Lord because at any given moment, a family can call and ask for a Priesthood blessing. As we’ve already covered in the quote, a blessing is much more than a prayer. It is being a spokesman for the Lord and is a humbling, but deeply spiritual experience. Yesterday when visiting one of my families, the father asked us (me and my home teaching companion) to give him a blessing. He asked me if I would be the one to give the blessing. When giving a blessing, the Elders place their hands on the head of the individual receiving the blessing. If it is a blessing of healing, consecrated olive oil is placed on the individual’s head and one Elder annoints the oil through a quick prayer and then the next Elder, who will be giving the blessing places his hands on the head together with the first Elder. He opens the prayer by sealing the annointing and then speaks as thoughts from the Holy Spirit enter His mind. After my companion annointed the head of the father, I sealed the annointing as outlined. It was a deeply moving experience for me as thoughts and feelings came to my mind and heart of how much God loved this father and viewed him as His son. Feelings of how noble and valued he was in the sight of God entered through me and it was hard for me not to get emotional. Towards the conclusion of the blessing, I felt a strong feeling of Jesus’ suffering on the cross and in the Garden of Gethsemane for our sins. I became very touched and cried openly as I spoke words of comfort and encouraged the father to turn to the Lord and place his burdens at His feet. I’ve given many blessings in my life. Some are very moving like this one and others are less moving, yet still spiritual and simple. One thing I know is that in each case, I am not speaking my own thoughts and feelings, but I am speaking as a spokesperson for God. It is a very humbling experience and a privilege that I am grateful to have the opportunity to participate in on occasion. I realize priesthood blessings are very sacred for those who have both received and given them. However, if you are comfortable with sharing your experiences, I think it would be good for those less familiar with blessings to learn from you. Also, any of you who may not be Mormons and have additional questions, feel free to ask! I loved this post. As you described your feelings as you gave this blessing, it reminded me of times that I have felt these same feelings as I was the one recieving the blessing. I’m so grateful for worthy priesthood holders in my life that I can ask to give me a blessing anytime I feel like I need extra help or comfort. Often during a blessing I feel as if Heavenly Father’s arms are around me helping me through. Other times it’s not as strong, but I always feel the feelings of comfort that come through the spirit. Thanks for writing your post so I could be more grateful!